On 7 July 2018, cooperators around the world will celebrate the International Day of Cooperatives with a slogan: “Sustainable societies through cooperation”. This year CICOPA has decided to focus on the environmental dimension of the sustainability. A choice motivated by the fact that climate change and the need to tackle the current environmental crisis are being increasingly present in the international policy agenda. Many countries are experiencing its warning effects such as extreme weather events, from which vulnerable people are often affected most. To address these challenges, the Paris Agreement, a commitment to limit global temperature below 2 degrees, was adopted on 12 December 2015 at the COP21 in Paris. On the other hand, the UN Agenda 2030 and its Sustainable Development Goals (SDGs) strengthened the importance of moving towards more sustainable production and consumption patterns. Given these premises, what makes cooperatives in industry and services a valuable ally towards a green, sustainable and competitive economy? We could argue that, considering their local roots and community concern, cooperatives are particularly suitable for a sustainable use of endogenous resources, making them the appropriate formula for developing activities linked to the promotion of the green economy. An interesting debate in this regard has been elaborated by the ICA president Ariel Guarco, in his note “Co-operative Agenda to defend the planet“, where he points out that the power and responsibility of cooperatives in this field lie in their intrinsic purpose, namely to respond to the needs of local communities. Sustainable development, argues Guarco, can be achieved if innovation is at the service of people (and not of profit in the hands of a few shareholders); therefore cooperatives appear as “an alternative to the model that generated environmental degradation and inequality”. The potential for the development of cooperatives in industry and services is considerable: from sustainable tourism, energy, waste management, environmental education, sustainable construction to the management of forests and natural areas. 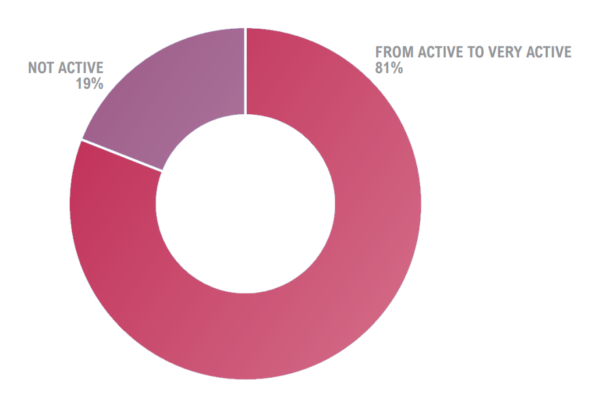 The big majority of CICOPA members consulted on this topic pointed out growing trends and interest in this field, and identified technological and environmental innovation as one of the new driving forces of the cooperative development in their country. In some cases, these activities are contributing to launch new emerging activities, such as renewable energy (which seems to be more consolidated in North Europe and North America but is displaying a strong development potential also in other countries such as Italy and Uruguay), or environmental services (Vietnam); in other cases, they are helping the conversion and market repositioning of activities facing difficulties since the 2008 economic crisis, like in the construction sector (France, Spain). How CICOPA members concretely contribute to a greener economy? An interesting “testing ground” for the development of cooperatives, in particular worker cooperatives, in the green economy is Andalusia (Spain). According to the Andalusian Federation of Worker Cooperatives (FAECTA), Andalusia is the Spanish autonomous community with the highest number of cooperatives and cooperative employment being created: about 4,000 cooperatives (around 18% of the total number of cooperatives in Spain), 80% of which are worker cooperatives. In addition to that, according to a study published by FAECTA in 2015, Andalusia is the second autonomous community generating « green jobs ». 132 are cooperatives (in their big majority worker cooperatives) active in environmental-related activities, mostly in the blue economy (maritime sector), followed by environmental services and education, recycling, ecotourism, organic farming, renewable energy and bioconstruction. While the Andalusian case illustrates emerging trends and opportunities for worker cooperatives in the green economy, other regional experiences serve as examples of practices that have been consolidated over the last decades. It is the case of forestry cooperatives in Quebec, whose history goes back to the 1930’s, when they were created to improve the conditions of workers who were constrained to earn their living in very difficult conditions. Today, the Quebec Federation of Forestry Cooperatives (affiliated to CICOPA’s Canadian member CWCF) represents the totality of worker cooperatives and social cooperatives (called “solidarity cooperatives” in that region) active in the forest sector in Quebec. Its 40 cooperatives gather 2,700 worker-members and create jobs for approximately 3,500 individuals, generating over US$250 million in revenue. In fields such as recycling and waste management, worker and social cooperative have been proving a capacity to combine environmental protection with the provision of decent jobs even to the most vulnerable categories of the society. A paradigmatic experience comes from Argentina: the worker cooperative Creando Conciencia (Creating Awareness), associated to CICOPA’s member FECOOTRA, was founded in 2005 in the Buenos Aires province, upon the initiative of a group of neighbours who were concerned about the urban management of solid waste. Since its beginning, it has been involved in the collection, sorting and recycling of waste, as well as the design and construction of plastic furniture. The majority of the cooperative founders were unemployed former urban waste pickers who had been hired by large waste collection companies, precariously and for short periods. Through the establishment of the cooperative, they could get stable jobs and capitalise their previous knowledge and commitment to the environment. Today, the cooperative associates 50 members, most of them women, and plays a leading role in the building process of the cooperative recycling sector, which has been considerably expanding in Argentina over the last few years. 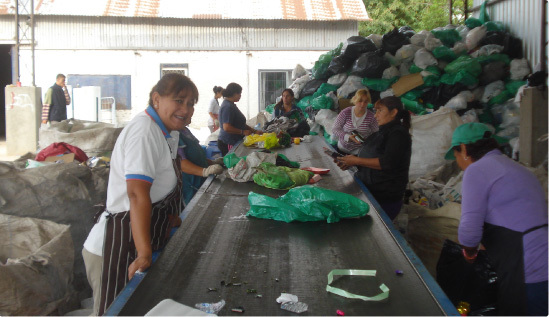 With the support of FECOOTRA, Creando Conciencia has contributed to the creation at the end of 2014 of the National Network of Waste Pickers. This network provides an integrated strategy for the entrepreneurial development of its member cooperatives as well as a joint approach in awareness raising on environmental issues. Elsewhere, like in Sweden or Italy, several work integration social cooperatives are active in fields such as recycling, gardening, and farming, employing disadvantaged people usually excluded from the labour market. Similarly, CICOPA’s Japanese member JWCU reports projects launching bio-diesel production from recycled cooking oil in Tokyo, among which the cooperative Aguriin, a plant employing young people with mental disabilities or social fragilities that produces bio-diesel fuel produced for local enterprises, such as bus companies. JWCU is currently supporting the launch of four similar plants throughout the country but their development is quite slow because they struggle to attain a larger scale and market attractiveness. Indeed, the development reported by our members in the green economy is often slowed down by significant obstacles: the shortage of financing and strong supporting measures prevent these activities from reaching their full potential, which would require considerable investments in innovation and technology. There are some interesting initiatives promoted by CICOPA members to strengthen the capacity of their affiliated cooperatives and call for their development in this specific field. The experience reported by SCOP BTP, representing worker cooperatives in the construction and public works sector in France, deserves special attention. In 2015, the federation launched its Corporate Social Responsibility label, thanks to a close partnership with the body specialised in CSR certification Afnor. In the view of its promoter SCOP BTP, the recognition granted by this label can substantially raise awareness about sustainable development among cooperatives active in construction and promote their approach in this field. For this purpose, a dedicated webpage was launched: it provides practical information about the label and good practices within the movement. ← How worker cooperatives deal with tensions?